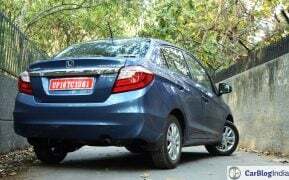 A few months back, Volkswagen stepped into the compact sedan segment in India, a segment ruled by Maruti’s Swift Dzire, followed by the Hyundai Xcent and Honda Amaze. 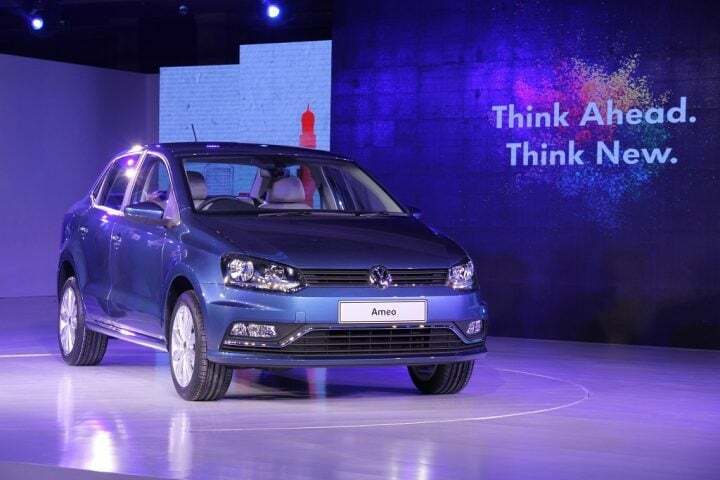 Leading Volkswagen’s charge is the Ameo that was unveiled just before the Auto Expo in February 2016. A derivative of the Polo‘s platform, the Ameo has been specifically designed for the Indian market where compact sedans are immensely popular. Volkswagen might be a little late to the party, and although they have had time to study the market carefully, competing for market share with the Swift Dzire, Amaze and the likes will not be an easy task. Is the all-new compact sedan from Volkswagen up to the task? Find out here in our Volkswagen Ameo vs Maruti Swift Dzire vs Honda Amaze comparison of specifications and prices. In terms of pricing of petrol variants, the Volkswagen Ameo is at par with the Maruti Dzire and 10-20 thousand cheaper than the Honda Amaze. 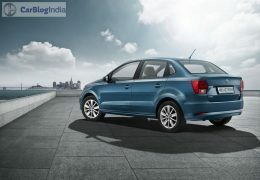 Volkswagen’s aggressive pricing makes the Ameo great value for money keeping in mind the features it has on offer. The diesel variants of the Ameo are offered with either a 5-speed manual or a 7-speed DSG automatic transmission. They are cheaper than the Amaze diesel variants. Also See – 2016 Honda BR-V – Another Failure from Honda Cars India? The Ameo comes packed with features including segment firsts such as cruise control and rain sensing wipers. 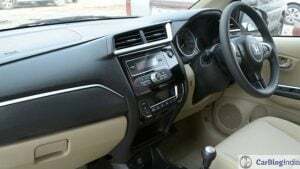 Additionally, it also gets features like rear aircon vents, auto headlamps, cooled glovebox, and a touchscreen infotainment system, which are not offered on the Dzire or the Amaze. ABS and dual front airbags are offered as standard fitment across all variants of the Volkswagen Ameo. All this ensures the Ameo stays ahead of its competitors in terms of features and safety. Keeping in mind the pricing of VW’s compact sedan and the long list of features, the Ameo is undoubtedly good value for money. The Volkswagen Ameo shares its powertrains with the Polo, which means it is powered by a 1.5 L TDI diesel and a 1.2 L petrol engine. However, the 1.5 L TDI diesel is an updated unit and churns out more power and torque. Maruti offers the Swift Dzire with a 1.2 L Petrol and a 1.3 L Diesel mated to 5-speed manual transmissions. Additionally, the petrol version comes mated to an optional 4-speed AT while the diesel comes mated to a 5-speed AMT. The Amaze petrol comes with a 1.2 L unit mated to either a 5-speed MT or CVT. Diesel powered Amaze has a 1.5 L Diesel unit mated to a 5-speed manual transmission. Ameo petrol is a bit down on power compared to the other two, but torque is nearly identical. All compact sedans on sale right now have been derived from hatchbacks with an awkward looking boot sticking out from the back and the Ameo is no different. But it still manages to pull off the look better than the Dzire. 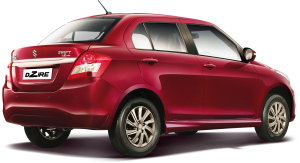 Honda Amaze looks more proportionate than the other two. The Ameo’s tail section is more squarish than usual VW designs and could have done with softer edges. 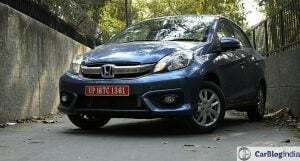 Honda recently gave the Amaze a facelift and it now looks much better than the previous model. The Dzire isn’t the prettiest one around, but its popularity suggests looks aren’t as important to customers as brand image and price. The interiors of the Volkswagen Ameo are almost identical to what we have seen on the Polo. They boast of the same black-beige combo with silver highlights for the centre console along with a sporty flat bottomed steering wheel. The Dzire’s neatly laid out cabin scores well on quality and fit and finish. Following the launch of the updated model, the Amaze now features a better dashboard design, but it is let down by cheap plastics and low-quality bits all around. The popularity of compact sedans is constantly on the rise, a fact that has been highlighted by the stellar sales figures of the Maruti Swift Dzire. The arrival of the Volkswagen Ameo should shake things up a bit. Volkswagen is perceived as a premium brand in India, which, coupled with the Ameo’s long list of features and aggressive pricing, should help push sales. Design – It is very hard to make a compact sedan look good, a fact demonstrated by most such models on sale right now. Volkswagen has done a tidy job of integrating the boot into the Polo, but the Amaze is still the more proportionate design. 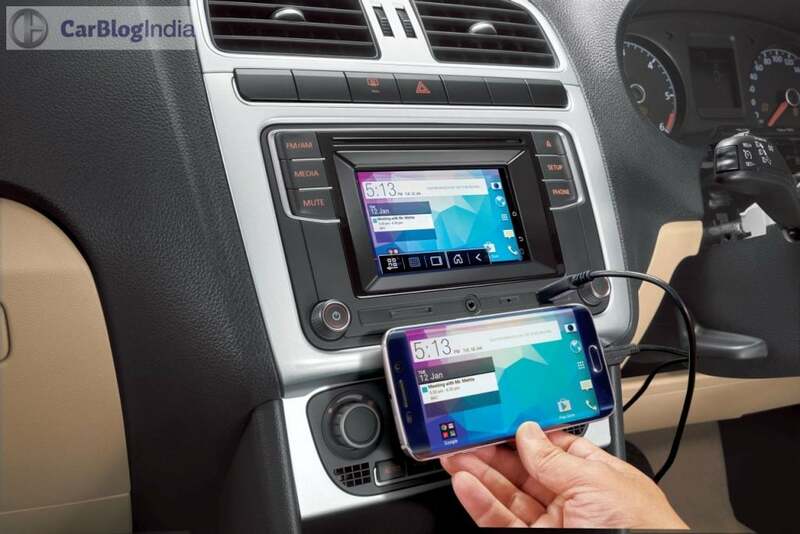 Features – Volkswagen has packed the Ameo with features and other two aren’t even close in terms of the equipment on offer. 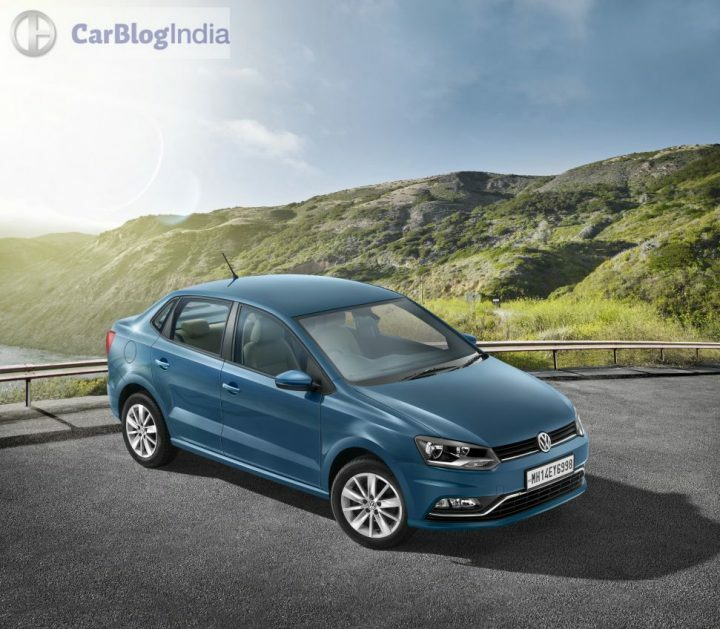 Specifications – The Ameo utilises the Polo’s 1.2 L petrol and an updated version of the 1.5 L diesel later on. Diesel Dzire gets an optional 5-speed AMT. Amaze’s 1.5 L diesel terribly unrefined. 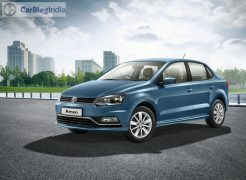 Price – Volkswagen isn’t exactly known for its aggressive pricing, but they seem to have turned things around with the Ameo. Pricing is nearly identical to that of the Maruti Dzire’s and it is cheaper than the Honda Amaze, which makes the Ameo good value for money. So stay tuned to CarBlogIndia for updates on the Volkswagen Ameo vs Maruti Swift Dzire vs Honda Amaze. What do you have to say about our Volkswagen Ameo vs Maruti Swift Dzire vs Honda Amaze comparison? Do share your views in the comments section below.